(Phys.org)—While some advanced humanoid robots already look eerily lifelike, robots in the future may actually become partly alive. Currently, researchers are working on integrating living cells and other biological components with electronic components in an attempt to create bio-hybrid robots. These robots could act autonomously, imitate some animal behaviors, and have the ability to self-replicate some of their parts. One of the major challenges in developing bio-hybrid robots consists of creating an interface to allow communication between the biological and electronic components. This task is inherently difficult because the vast majority of cellular signals are simply not compatible with electronics. Most cellular processes use signals that travel too slowly to interface with electrical signals, and exposure to electrical charges has negative effects on many cells, which can lead to cell death. Despite these challenges, a team of researchers, Orr Yarkoni, Lynn Donlon, and Daniel Frankel from the Department of Chemical Engineering at Newcastle University in the UK, has developed a way to make communication between these two domains possible. In their study, the researchers genetically engineered protein cells from a Chinese hamster ovary to produce nitric oxide in response to visible light. 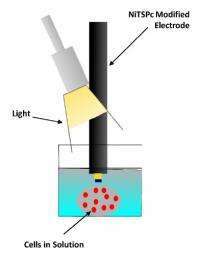 When the mutant cells were coupled to a platinum electrode, the resulting device could convert an incoming optical signal to a chemical signal, which could then be converted into an electrical signal. This signal transduction pathway provides an important step in developing future bio-hybrid robots. "The bio-electronic interface is notoriously difficult to manipulate," Frankel told Phys.org. "Usually the electronics are modified to fit the biological system of interest with limited success. This is the first time that we have tried an alternative approach, to modify the biology (via genetic engineering) to fit the electronics." One of the keys to opening a communication channel was identifying nitric oxide as a suitable chemical compound for the middle signal in the pathway. As the researchers explained, nitric oxide is one of the few compounds that meets all the requirements for this role: it can permeate cells, is highly diffusible, has a relatively short half-life, and is one of the rare cell signaling molecules that remains in its gaseous form in any cell environment. As an indication of its aptitude for signaling, nitric oxide is widely used in nature, playing a role in areas such as muscle relaxation, blood vessel widening (vasodilation), inadequate blood flow (ischaemia), penile erection, and stroke. Several proteins naturally produce nitric oxide in response to a chemical stimulus, but the researchers wanted to produce nitric oxide in larger amounts and in response to an optical stimulus. To achieve this, the researchers explained how they were able to "hijack" the protein's electron transfer pathway by severing a particular gene coding for a binding site required by the native pathway. In addition to removing that binding site, the researchers inserted amino acid structures called light-oxygen-voltage (LOV) domains into one or two regions in the protein. Since these structures are capable of accepting an electron from an incoming photon, they make the protein produce nitric oxide in response to light. In experiments, the researchers observed that mutant cells that were modified with LOV domains produced more nitric oxide than the wildtype cells when exposed to light. Increasing the light stimulus further increased the mutant cells' nitric oxide production, while the wildtype cells exhibited limited photosensitivity. The researchers also found that mutant cells with two LOV domains produced about twice as much nitric oxide as those with only one LOV domain. When coupled to an electrode, the mutant cells could produce sufficient nitric oxide to cause a change in the electrode's current. By changing the light intensity, the researchers could control the communication signals traveling through this optical-chemical-electrical cascade. Unlike typical solid-state photodetectors, these devices have the ability to self-reproduce and the potential to combine input signals to perform computation. These advantages could be turned into useful applications in a future generation of advanced robots. "This work is part of a bigger project to build a swimming bio-hybrid robot called 'Cyberplasm,'" Frankel said. "These cells are the 'eyes' of the robot able to respond to light and tell the robot to alter its swimming pattern in response. The complete robot is still in development, but we are working on the individual parts. Potential applications are robots that can swim into contaminated areas, detect chemicals and report back." Co-investigators of the Cyberplasm project are Joseph Ayers at Northeastern University in Boston, Chris Voigt at MIT, and Vlad Parpura at the University of Alabama. The next step for the researchers is to produce cells that can communicate with electronics in response to chemical stimuli, and in addition communicate with each other. Still far too big for what I'd like to see, such as the intelligent robotic immune system concept. At least they moving in a good direction here. I would imagine such systems could be used to test all sorts of chemical and perhaps radioactive properties after accidents and other disasters. Really need a nano-scale protonic-to-electronic converter so that you could control cell growth and behavior at the molecular level via computer. While the Character "Walter Bishop" from the "Fringe" television series can probably do that with existing technology, it's unlikely you could copy a human brain to software for the foreseeable future. You need a simulator that precisely models the neural net of the brain in everyway, and you need mechanism for initializing that simulated net, and of course both the Secondary Memory (not so much of a problem) and primary memory (very big problem) to store that much information. Humans probably have the equivalent of a couple terabytes worth of data and skills memorized, and in humans it's all interconnected in ways that existing software doesn't model very well at all. "Humans probably have the equivalent of a couple terabytes worth of data and skills memorized, and in humans it's all interconnected in ways that existing software doesn't model very well at all." Existing software, precisely. Wait till the quantum robot edges out the iPad on everyone's wish list. Then you can design your own friends. I see you're still one ball "lite". The exciting part is crossing the wet-dry boundary so simply. Now projects like Connectome can incorporate wetware as well. Hopefully, we will use the brain-computer interfaces to do something better than invent sexbots. BTW, to recreate a mind you will have to recreate it physically. No model will be identical to the wetware reality. No two wetware devices can ever be identical, so no minds can be copied identically. At what point do you loose enough congruity to end up with something very different? There is no way to predict what differences will arise from very small alterations because it is a non-linear, fractal, system. You might invent a roughly identical twin in software, but it will have its own personality, it will be a different entity. What about eyes for people? Someone try this on a nerve cell. Why do techophobes read phys.org? Do they use the articles for scary stories around campfires? "And then kids, the bionic boogie man cooked mother nature in a nuclear oven, frosted her with GMO, and gobbled her all up." Mmmmmm...self replicate. See real life remake of the movie: "The Evil Dead!"! You might invent a roughly identical twin in software, but it will have its own personality, it will be a different entity. Roger Penrose has credibly demonstrated that consciousness is a non-computational phenomenon, and as such, cannot be achieved by any computational device. At what point do you loose enough congruity to end up with something very different?